The NCAA Division I men’s basketball tournament captivates the state of Kentucky every March and this year all eyes are on John Calipari and the University of Kentucky. Can the top-seeded Wildcats bring a ninth national title back to Lexington by becoming the first team since 1976 to finish the season undefeated? University of Louisville fans may hope not. For some anglers, March also means Muskie Madness, an obsession among fanatics who tolerate the winter months waiting for their version of the Big Dance. Kentucky’s muskellunge lakes have iced out and people are primed for the spring bite while some northern lakes may still be iced over or the muskie seasons there haven’t opened. 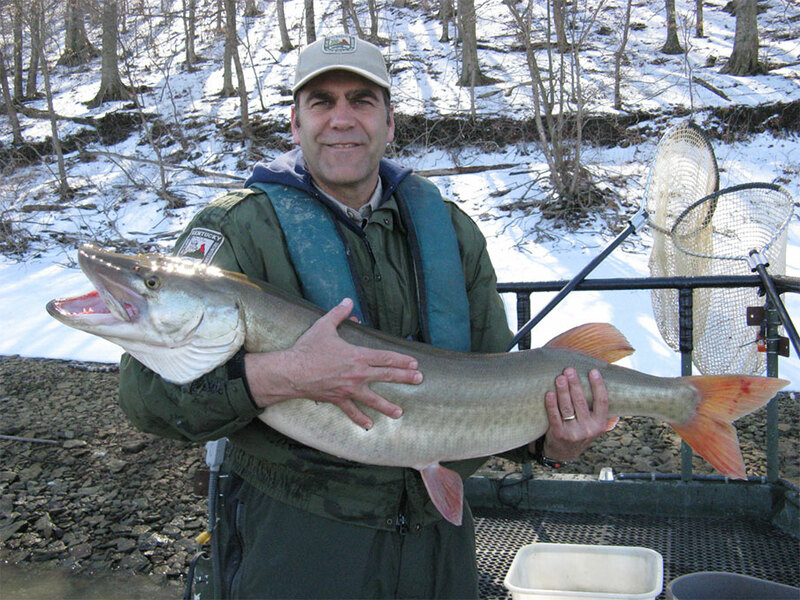 Kentucky is within the natural range of the Ohio strain of muskie. Dams built on some of the state’s native muskie streams in eastern and southern Kentucky last century formed Buckhorn, Cave Run and Green River Lakes. A study of native muskie populations in eastern Kentucky streams conducted in the mid-1960s and early 1970s found muskies began their pre-spawn movements in streams near the end of March and they spawned in late April to early May when water temperatures averaged 55 to 60 degrees. Reservoir-dwelling muskies follow the same instincts. At Green River Lake, the area around Green River Marina is popular among boat and bank anglers alike from mid-February through mid-April. Cave Run Lake, which produced the standing state record muskie in November 2008, features a similarly productive spot for bank anglers. Stoney Cove Recreation Area sits at a corner on the lake-side face of the dam. As a bonus, Stoney Cove offers close proximity to the tailwater area on the other side of Ky. 826. “That can be a great fishery,” in the spring, Thomas said of the tailwater below Cave Run Lake dam. The same holds true for the Tailwater Recreation Areas below Green River Lake and Buckhorn Lake. Outflow information for Buckhorn, Cave Run and Green River Lakes may be found by accessing the “Water Information” section on the Louisville District of the U.S. Army Corps of Engineer’s website at www.lrl.usace.army.mil. For muskie fishing, a favorable discharge rate is 1,500 to 2,000 cubic feet per second. In years when the water is not already elevated by late winter, Hardin has experienced fantastic muskie fishing on Cave Run Lake when the water is on the rise and the trees are just leafing out. Erratic weather and high water come with the territory in spring and add to the challenge of catching muskies. This year, snow melt and recent heavy rains have many lakes somewhere between summer pool and flood stage. Whether fishing by boat or on the bank, these conditions can be overcome. “Spring provides some of the best opportunities to catch a fat fish,” Hardin said. A novice muskie angler can get started with 7-foot heavy action baitcasting rod matched with a heavy duty baitcasting reel. Braided line in the 50- to 100-pound test class with a 9- to 18-inch wire leader offers a sense of security when a muskie strikes and thrashes on the end of the line. Rattling-style lipless crankbaits, minnow baits, jerkbaits, spinnerbaits and in-line spinners are all good offerings to have on hand in the spring. Live bait also is an option, but quick-strike rigging is recommended as a way to help reduce mortality rates for catch-and-release muskies. Kentucky Fish and Wildlife Resources stocks Buckhorn, Green River and Cave Run Lakes annually with 13-inch fingerlings reared at the Minor E. Clark Fish Hatchery near Morehead for the purpose of maintaining trophy fisheries. Dewey Lake also was stocked with muskie last year because of hatchery surplus but those fish aren’t expected to reach 36 inches until 2019. A 36-inch minimum size limit for muskies is in place for Buckhorn, Cave Run and Green River Lakes. Earlier this month, the Kentucky Fish and Wildlife Commission proposed a 36-inch size limit for Dewey Lake that would go into effect in March 2016 pending legislative approval. There is a 30-inch size limit on muskie elsewhere in the state. Anglers are reminded to purchase their 2015-16 fishing licenses as the new license year started March 1. Consult the Kentucky Fishing and Boating Guide for complete licensing information. It’s available online at fw.ky.gov and wherever licenses are sold.